Karachi is known for shopping, museums, nightlife, beaches, and parks. Your plan includes some of its best attractions: buy something for everyone on your list at Dolmen Mall Clifton, view the masterpieces at Frere Hall, appreciate the history behind Mazar-E-Quaid, and get engrossed in the history at Mohatta Palace Museum. To see more things to do, ratings, other places to visit, and more tourist information, go to the Karachi road trip planning app . The Route module shows you all the different ways you can get to Karachi. Expect a daytime high around 41°C in April, and nighttime lows around 28°C. Wrap up your sightseeing on the 23rd (Tue) early enough to travel to Lahore. Lahore is known for historic sites, museums, shopping, parks, and zoos & aquariums. Your plan includes some of its best attractions: contemplate in the serene atmosphere at Badshahi Mosque, get to know the fascinating history of Lahore Guided tours, step into the grandiose world of Lahore Fort, and admire the natural beauty at Shalimar Bagh (Shalimar Gardens). Plan my Lahore trip by asking Inpirock to come up with tips and suggestions. Getting from Karachi to Lahore by flight takes about 4.5 hours. Other options: drive; or take a bus. Traveling from Karachi in April, expect little chillier with lows of 24°C in Lahore. Wrap up your sightseeing on the 26th (Fri) to allow time to travel to Qila Rohtas. Start off your visit on the 27th (Sat): don't miss a visit to Rohtas Fort. To find maps, more things to do, and tourist information, read our Qila Rohtas trip planner . Traveling by car from Lahore to Qila Rohtas takes 4 hours. Expect a bit cooler temperatures when traveling from Lahore in April; daily highs in Qila Rohtas reach 36°C and lows reach 20°C. You will have some time to spend on the 27th (Sat) before leaving for Khewra. Khewra is the second most populated City of Jhelum and the neighbor City of Pind Dadan Khan Tehsil in Jhelum District, Punjab province, Pakistan, it is located at 32°38'60N 73°1'0E. Start off your visit on the 28th (Sun): discover the riches below the earth's surface at Khewra Salt Mine. Use Inspirock's suggestions to plan your Khewra trip and find the best activities and attractions for your vacation. Drive from Qila Rohtas to Khewra in 2.5 hours. In April, daytime highs in Khewra are 38°C, while nighttime lows are 22°C. On the 28th (Sun), you'll have the morning to explore before heading off to Hunza. 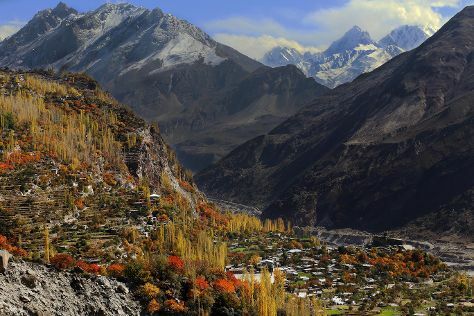 A tour of Hunza lets you discover a mountainous valley surrounded by massive snowcapped Himalayan peaks. Start off your visit on the 29th (Mon): step into the grandiose world of Baltit Fort, admire the verdant scenery at Hunza Valley, and then admire the verdant scenery at Hunza Valley. To find photos, ratings, other places to visit, and other tourist information, read our Hunza route maker website . Getting from Khewra to Hunza by combination of taxi and flight takes about 5.5 hours. Other options: do a combination of taxi, flight, and car; or drive. Finish your sightseeing early on the 29th (Mon) so you can drive to Skardu. The notable peaks that surround Skardu may be rugged, daunting, and otherworldly, but the imposing reputation of its most famous natural attractions belies the more fertile, diverse, and homely aspects of the town. Kick off your visit on the 30th (Tue): explore the striking landscape of Deosai National Park. Keep things going the next day: admire the sheer force of Manthokha Waterfall, examine the collection at K2 Museum, then take in the spiritual surroundings of Manthal Buddha Rock, and finally contemplate the waterfront views at Upper Kachura Lake. To see more things to do, other places to visit, reviews, and more tourist information, read Skardu trip itinerary maker . Drive from Hunza to Skardu in 6.5 hours. Finish your sightseeing early on the 1st (Wed) to allow enough time to travel to Islamabad. The country's capital since 1963, Islamabad has the look and feel of a planned administrative city because, by and large, that's exactly what it is. 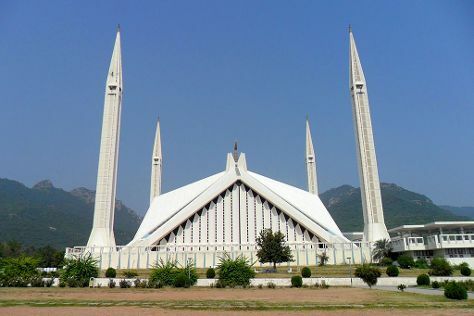 Islamabad is known for historic sites, museums, parks, nature, and shopping. Your plan includes some of its best attractions: take in the spiritual surroundings of Faisal Mosque, take some stellar pictures from Daman-e-Koh, see the interesting displays at Pakistan Monument Museum, and explore the striking landscape at Margalla Hills. To see where to stay, photos, traveler tips, and more tourist information, go to the Islamabad day trip planning app . You can fly from Skardu to Islamabad in 1.5 hours. In May, daytime highs in Islamabad are 42°C, while nighttime lows are 26°C. Finish your sightseeing early on the 4th (Sat) to allow enough time to travel back home.